Josiah and I created a winning entry to the annual Scarecrow Fest at Emma Krumbee’s. We were very excited to place first in the Traditional category! This was the 2012 Contest. Emma Krumbee’s 2013 Contest found me doing something different this year. I decided to make a Celebrity Scarecrow. 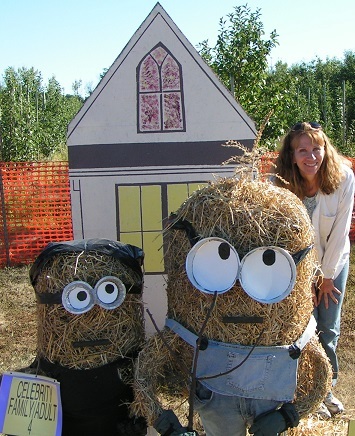 I tried hard to duplicate the Minions in my “American Gothic – Minions”. It wasn’t coming together very well for me and I almost didn’t enter them. But I walked away with First place and that was exciting! 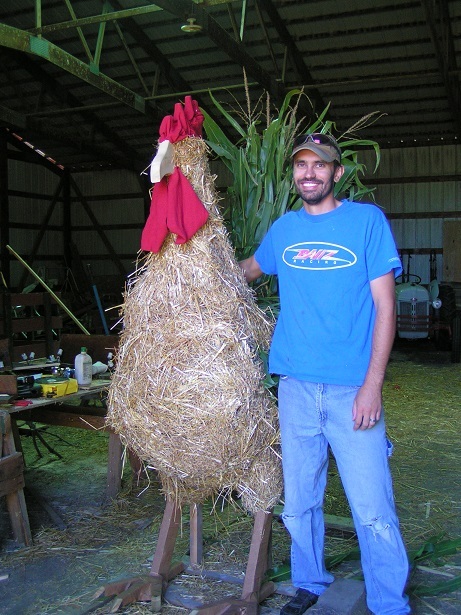 Josiah placed 2nd in his Traditional category – his scarecrow was “Scare – Crow”. October 1st 2011 In August Alexaphera (Lexi) joined Cherith Farms. 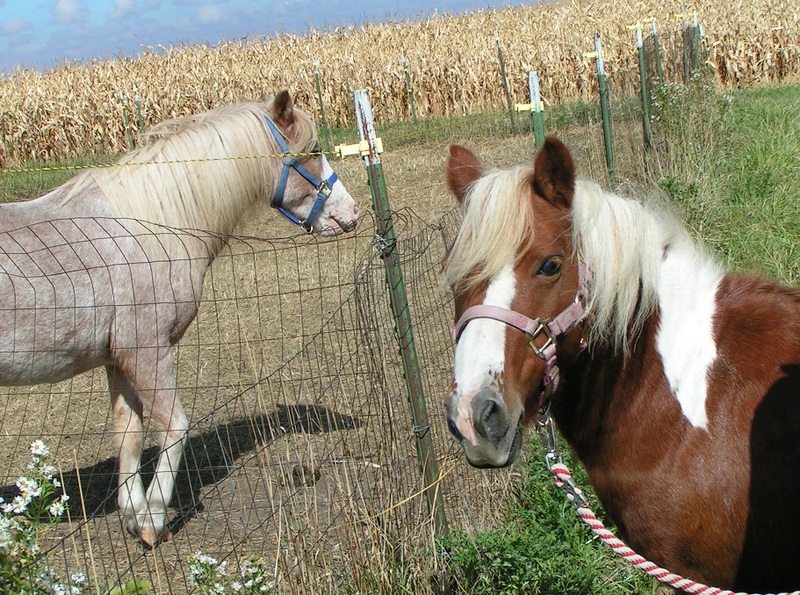 She is a cross between Shetland and Welsh pony. She is very beautiful and has a smooth trot gate. I am hoping to train her to the cart next year. Although she seemed to adjust well to her new home, I felt she was lonesome for horse company so I also acquired Tinkerbell from some friends in New Prague. She is already trained to cart and I am hoping to learn to drive her later this month. 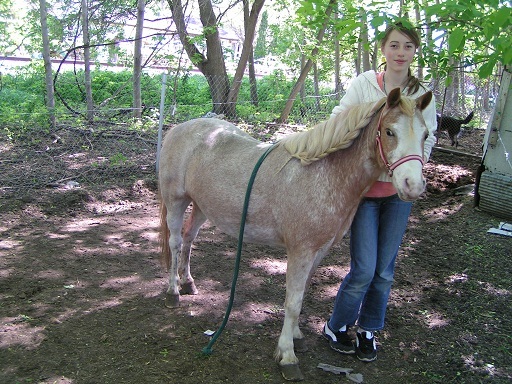 Tinkerbell is a full bred Shetland. She has such a sweet, affectionate personality she will be great with kids. Please come and meet them next berry season! 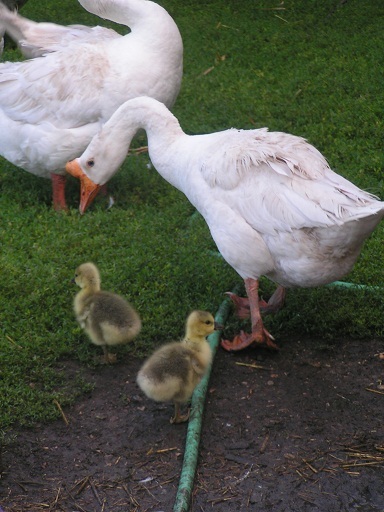 Asparagoose with her two baby gosslings. We welcome two new babies to our group this year. The gosslings hatched about 3 days ago. They are very cute. They are part White Chinese and part Toulouse. They are being introduced to the group naturally by the parents. 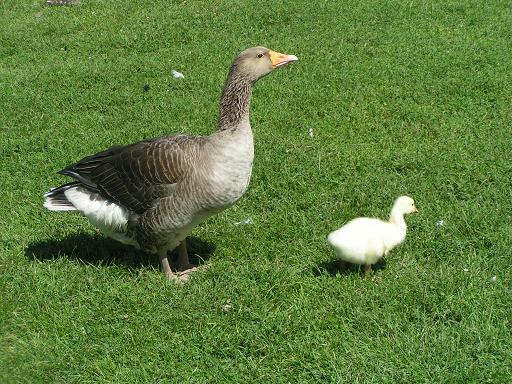 We have learned though that geese believe in the saying that it “takes a village to raise a child”. It seems the whole group is very interested in this baby. I am happy say that we are celebrating our first one year mark for adopting Vanessa! What a dog she has been. She was in bad emotional state when we adopted her last July. She also had chronic stomach problems which has gotten better along with her psychological improvement. She does things other dogs do now like barks when she is excited, eats some foods that fall on the floor (She would not eat pubicly when we got her. I still feed her under my bed but she will eat in front of a few people now.) This dog loves to run and loves to play. She would do it all day if I could keep up with her!!!! The most amazing part is that her hair grew in like her Border Collie part of her. Last year she looked more like a Blue Heeler which is her other side. We love her and are so happy that she is making her adjustments and getting healed! Alexi after Felicity gave her a quick grooming. We will be bring our pony home soon! Her name is Alexaphera. She is a part Welsh and part Shetland. I am hoping to train her to drive. It is possible in time that we also will be able to give some pony rides. She loves children and enjoys their attention. The fence is being put up currently and a special thanks to my friend, Gail for coming all the way from Mora, MN to help put up the poles this week. 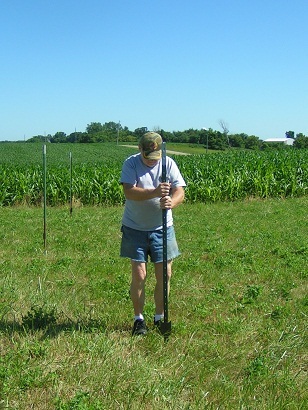 Putting up the fence posts. What a weird summer it has been! Almost every time it has rained, it has stormed. Today was no exception. It must of rained 8 inches throughout the day. The puddles got deep enough to do some serious splash fights! 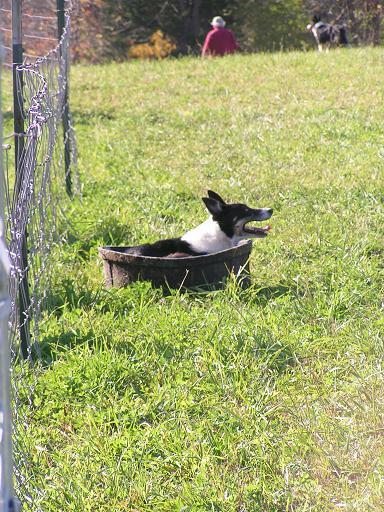 This past weekend October 8 -10 we had the privilege to attend one of my favorite events – a stockdog challenge. 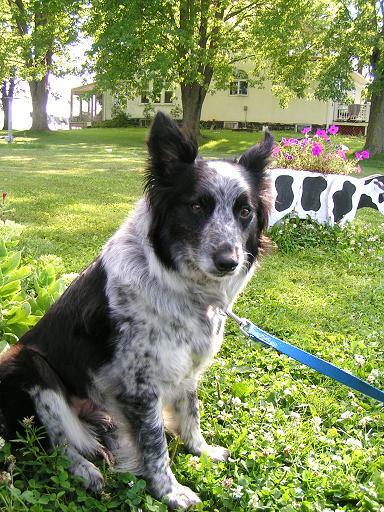 For those of you who don’t know me, I am a big fan of the Border Collie and have been for years even before I had the blessing of owning one. I had attended the “trials” at the Scott Co. Fair in previous years, but this one held last weekend at Gale Wood Farms in Minnetrista was the best of all. I did not even know this park existed! It is part of the Three River Parks System. It is tucked away in the beautiful hills near Lake Minnetonka. The colors were breathtaking!!!! I don’t know if the hills of Ireland could be more beautiful – the area of the world where these smart, agile, dogs that run like a streak of lightning come from. 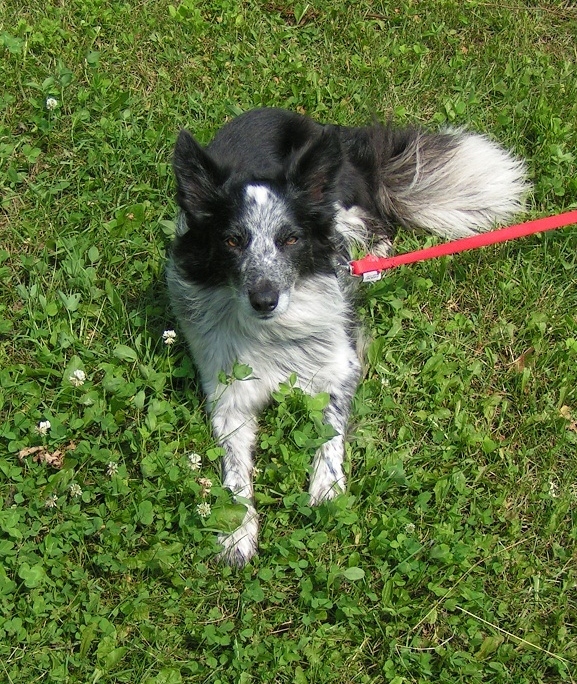 My own Border Collie had a pedigree with ancestors from Ireland. First let me comment on the park. Gale Woods is a fantastic idea to help people from the urban areas to know what a farm is about. Our society has moved away from the farm to the point where kids think the store produces the food. This is a way to present farm animals, and gardens and other agriculture to people who wouldn’t otherwise have a way to view it. The only trouble with this scenio is that this is the “perfect” farm, ones that dreams are made of. Most average farms have some run down buildings, weeds and of course poop. You don’t see to much of that here! But the animals are well cared for and cows and sheep have adequate grazing areas. We also went into the educational buildings where they have areas to learn about making yarn by watching the process of sheep being sheared to the spinning of yarn. They had food tasting stations where we tested a dip made of pumpkins. Also, they had honey and a person could take a beehive hike. Making Cider with a hand cider press. 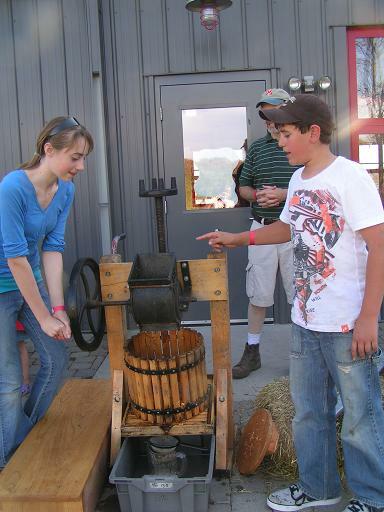 My kids had the opportunity to make cider using an old fashioned press. So there was many activities available inside. 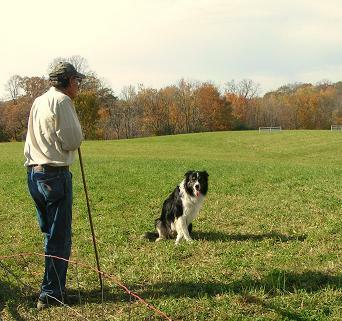 The site of the “Star of the North” Sheepdog Trial. 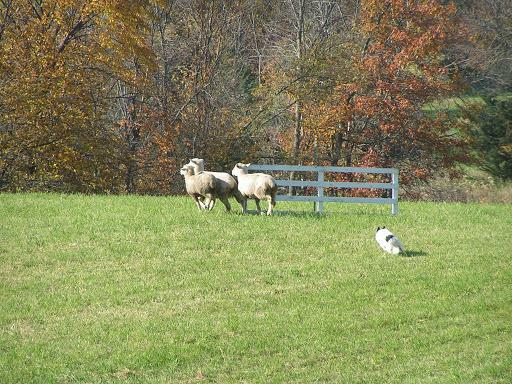 But my favorite, of course, was the Border Collies herding the sheep. 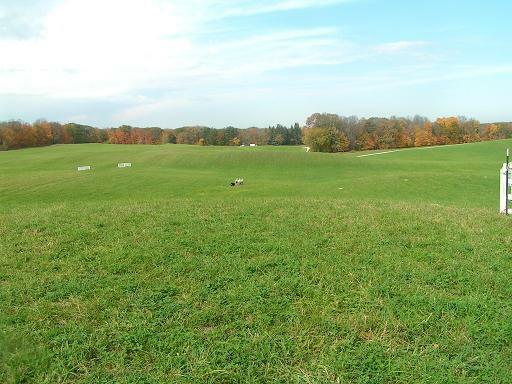 We walked down some very nice trails and made our way up a high hill to a pasture that was set up for the event. The weather was fantastic and the scenery so beautiful!!! Here was one of the prettiest BCs there predominately white. These dogs just love their job of moving those sheep! 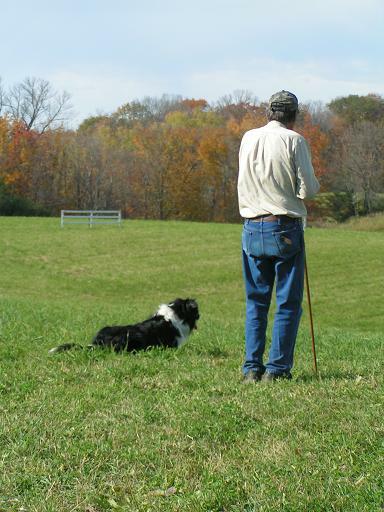 The dog watches his handler for the signal to get the sheep. The dogs are just as interested as their human handlers in competition. This dog has finally penned the sheep. After a hard run, this dog is ready for some rest and re-hydration. But best of all, I love meeting the dogs!!!! Isn’t this guy handsome? All and all, it was a wonderful day! I would recommend anyone to come to this event. Apparently, it is a yearly event taking place in October. The park is beautiful and is open for visitors who would like to spend a day in the country. I did find it very confusing as far as if there was an admission fee. 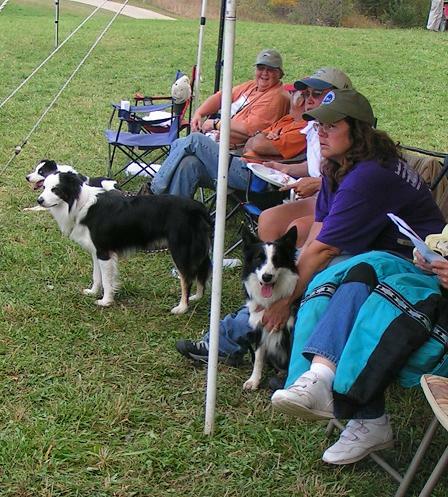 The Border Collie Challenge Event was free and open to the public. A person parks in the lot and then walks up a path to the hill. I think it was like maybe a half mile. There are many paths to walk on or bike. If you want to take advantage of a trolley, you must buy a wrist band for $7 and that also gets you admission to special program events. But as far as I know, the park is free to walk and bike on trails. 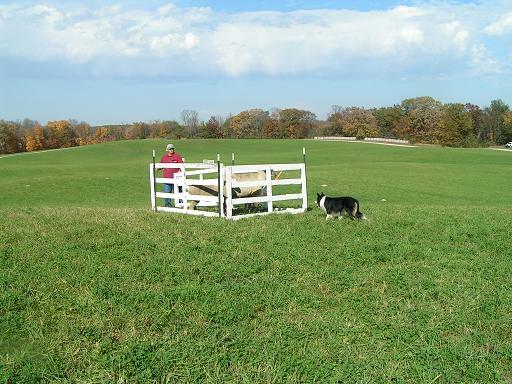 So remember for next year – “The Star of the North Sheepdog Trials”. After we lost Lady this year, we felt a good way to honor her memory was to give another dog a chance at a good home. We adopted a Border Collie/Blue Heeler mix, named Vanessa. She has been a handful both because she came with some physical and emotional issues. We are hoping that we will be able to train her and that she will be healed from both her tragic past as well as her colitis. 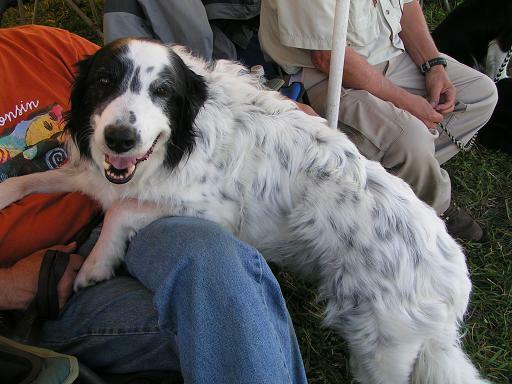 It was a very sad week for me to lose my companion dog of many years. Everybody loved Lady and she will be greatly missed this berry season. Bufflah and her gossling graze on the grass. Finally, Bufflah gets to be a Mom! She sat on a nest last January and February with no results and this time, she gets her wish. This photo we took today was her first time out of the barn with her baby. I am sure it feels great to be out of the stuffy barn and into the sun and breeze! Be sure to check her out when you visit! This past weekend – August 6,7,8th we enjoyed the annual Scott-Carver Thresher’s Festival. This year, my daughter and I “manned” the school house. It was a lot of fun. I was amazed at how many people attended a one room school house such as was on the grounds. 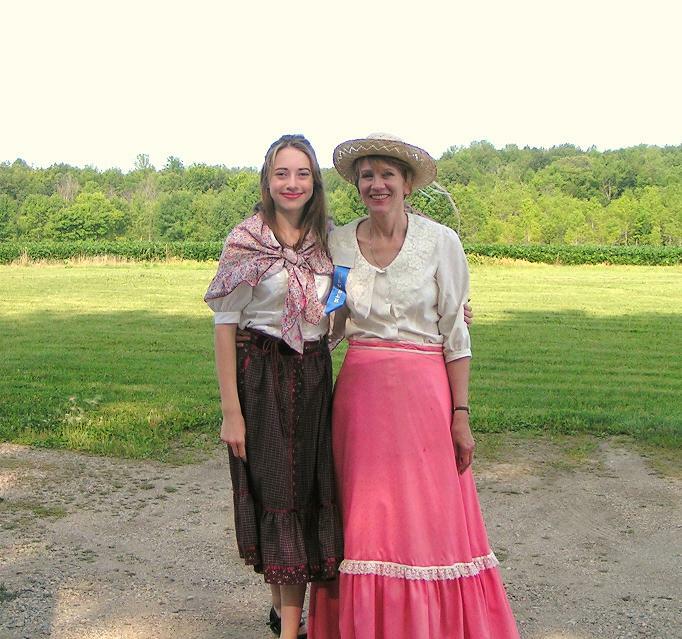 The school Marm and her assistant. 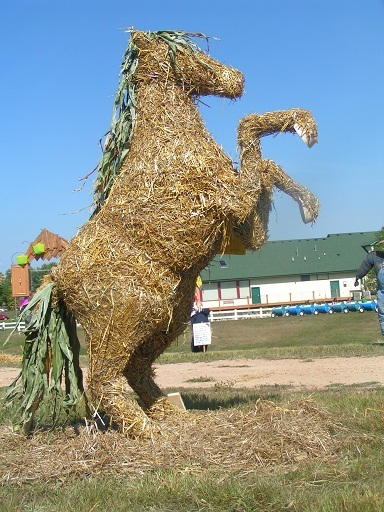 A favorite part of this harvest festival is the activities dealing with the horses. 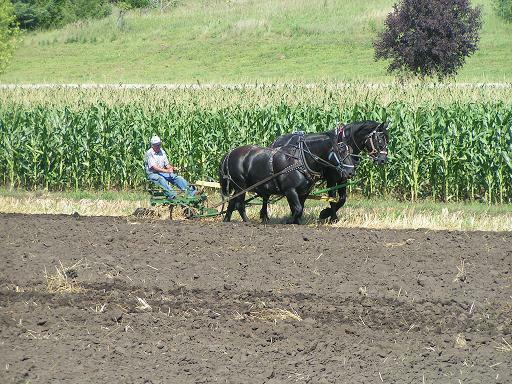 They had set up a demonstration of plowing with a team of two horses as well as disking. It was such a hot day! I think the town thermometer said 100 degrees! The black horses were sweating to beat the band! Needless to say, they did not push the horses and gave them frequent breaks out of the sun. The fella who is driving these horses also volunteers driving horses for the “Landing” in Shakopee. 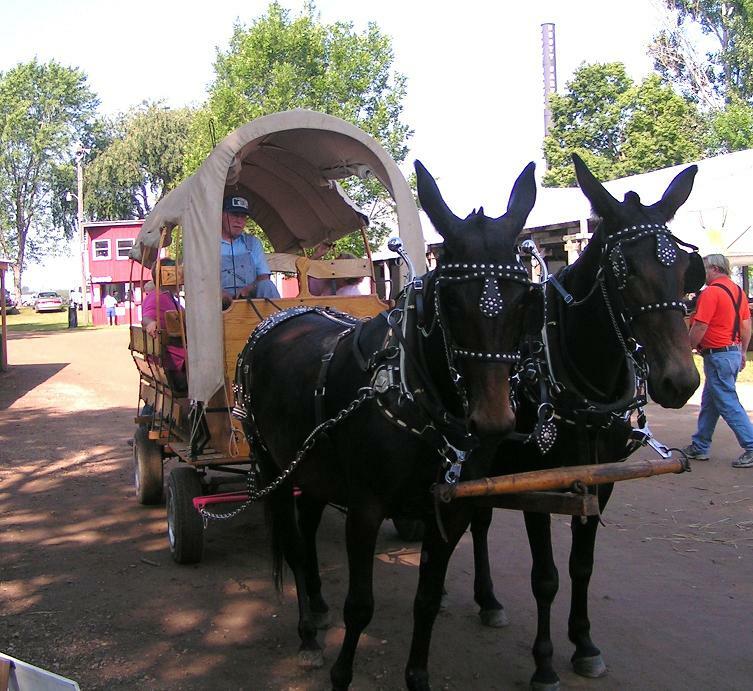 Another favorite part of the festival for me is to see my friend, Reuben, who brings his mule team and wagon to these events and gives people free rides. It is so wonderful to ride in this wagon. It is quiet and you can see all the sites while you ride by. Reuben, a man with a generous heart. Well, I guess we will wait again for next year’s festival! Despite the great heat, we had a wonderful time!